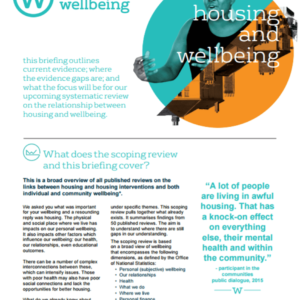 Based on a key evidence gap identified in our scoping ‘review of reviews’ on housing and wellbeing in 2016, this systematic review looks at the evidence on housing interventions for ‘housing-vulnerable’ adults and wellbeing. 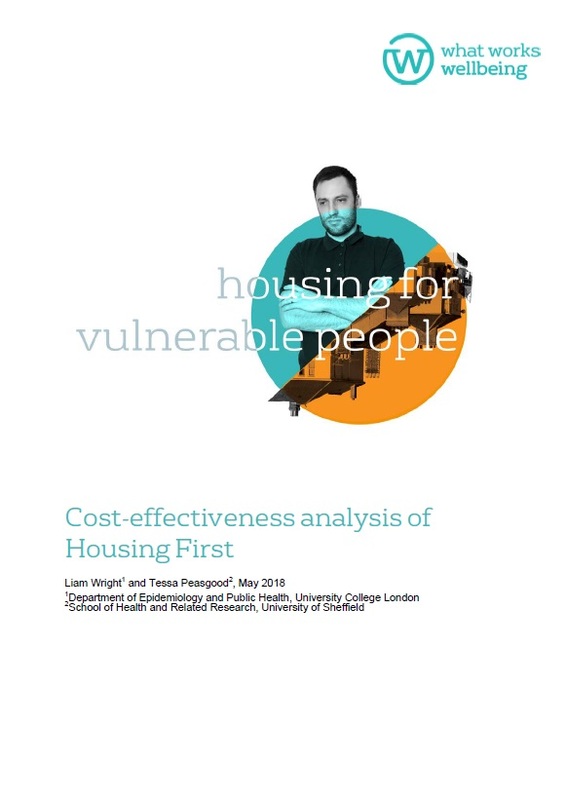 We also looked at the cost effectiveness of one of the key interventions, Housing First – an intervention to provide immediate, unconditional, access to housing for people with complex needs, with intensive support. In spite of its high profile, there is little evidence about its cost-effectiveness. You can view all sources in the full evidence review. 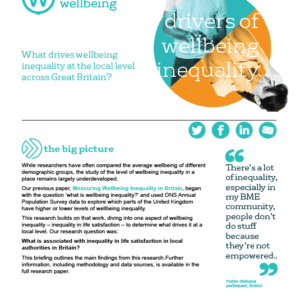 To view sources for the ‘pathways to wellbeing’ diagram in the briefing, you can click on the ‘Description’ tab below. Henwood, B. F., Hsu, H.-T., Dent, D., Winetrobe, H., Carranza, A. and Wenzel, S. (2013) ‘Transitioning from homelessness: A “fresh-start” event’, Journal of the Society for Social Work and Research, 4(1), pp. 47-57. See also other references in section 5.7. Padgett, D. K. (2007) ‘There’s no place like (a) home: ontological security among persons with serious mental illness in the United States’, Social Science & Medicine, 64(9), pp. 1925-36. See also other references in section 5.7. 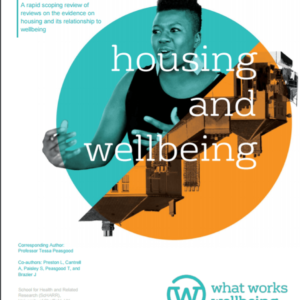 Woodhall-Melnik, J. R. and Dunn, J. R. (2016) ‘A systematic review of outcomes associated with participation in Housing First programs’, Housing Studies, 31(3), pp. 287-304. For supported housing, see Mares, A. S. and Rosenheck, R. A. (2011) ‘A comparison of treatment outcomes among chronically homelessness adults receiving comprehensive housing and health care services versus usual local care’, Administration & Policy in Mental Health, 38(6), pp. 459-75 and other references in section 8.4. Mares, A. S. and Rosenheck, R. A. (2011) ‘A comparison of treatment outcomes among chronically homelessness adults receiving comprehensive housing and health care services versus usual local care’, Administration & Policy in Mental Health, 38(6), pp. 459-75. Poremski, D., Stergiopoulos, V., Braithwaite, E., Distasio, J., Nisenbaum, R. and Latimer, E. (2016) ‘Effects of Housing First on Employment and Income of Homeless Individuals: Results of a Randomized Trial’, Psychiatric Services, 67(6), pp. 603-9. See also references in section 6.2. Brown, M. M., Jason, L. A., Malone, D. K., Srebnik, D. and Sylla, L. (2016) ‘Housing first as an effective model for community stabilization among vulnerable individuals with chronic and nonchronic homelessness histories’, Journal of Community Psychology, 44(3), pp. 384-390. Stergiopoulos, V., Gozdzik, A., Misir, V., Skosireva, A., Sarang, A., Connelly, J., Whisler, A. and McKenzie, K. (2016) ‘The effectiveness of a Housing First adaptation for ethnic minority groups: findings of a pragmatic randomized controlled trial’, BMC Public Health, 16(1), pp. 1110. Polvere, L., Macnaughton, E. and Piat, M. (2013) ‘Participant perspectives on housing first and recovery: early findings from the At Home/Chez Soi project’, Psychiatric Rehabilitation Journal, 36(2), pp. 110-2. See UK Housing First evaluations in section 5.5. 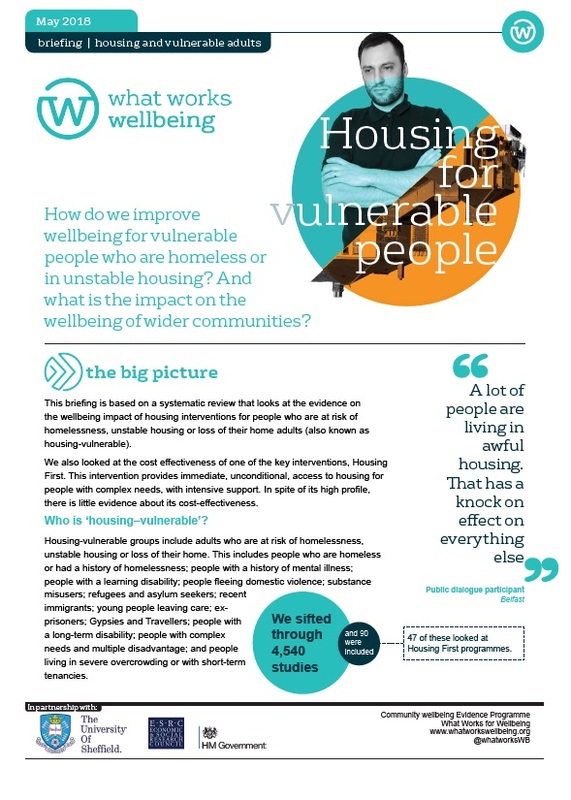 Stergiopoulos, V., Gozdzik, A., O’Campo, P., Holtby, A. R., Jeyaratnam, J. and Tsemberis, S. (2014) ‘Housing First: exploring participants’ early support needs’, BMC Health Services Research, 14, pp. 167. See also section 5.5 as above. Supported housing: Gilmer, T. P., Stefancic, A., Katz, M. L., Sklar, M., Tsemberis, S. and Palinkas, L. A. (2014a) ‘Fidelity to the housing first model and effectiveness of permanent supported housing programs in California’, Psychiatric Services, 65(11), pp. 1311-7. Housing First: Alaazi, D. A., Masuda, J. R., Evans, J. and Distasio, J. (2015) ‘Therapeutic landscapes of home: Exploring Indigenous peoples’ experiences of a Housing First intervention in Winnipeg’, Social Science & Medicine, 147, pp. 30-7. Housing First: Macnaughton, E., Townley, G., Nelson, G., Caplan, R., Macleod, T., Polvere, L., Isaak, C., Kirst, M., McAll, C., Nolin, D., Patterson, M., Piat, M. and Goering, P. (2016) ‘How does Housing First catalyze recovery? : Qualitative findings from a Canadian multi-site randomized controlled trial’, American Journal of Psychiatric Rehabilitation, 19(2), pp. 136-159. Patterson, M. L., Rezansoff, S., Currie, L. and Somers, J. M. (2013b) ‘Trajectories of recovery among homeless adults with mental illness who participated in a randomised controlled trial of Housing First: a longitudinal, narrative analysis’, BMJ Open, 3(9), pp. e003442. Supported housing: Padgett, D. K., Smith, B. T., Choy-Brown, M., Tiderington, E. and Mercado, M. (2016) ‘Trajectories of recovery among formerly homeless adults with serious mental illness’, Psychiatric Services, 67(6), pp. 610-614. Gilmer, T. P., Stefancic, A., Katz, M. L., Sklar, M., Tsemberis, S. and Palinkas, L. A. (2014a) ‘Fidelity to the housing first model and effectiveness of permanent supported housing programs in California’, Psychiatric Services, 65(11), pp. 1311-7. See UK evaluations of Housing First included in section 5.5. Adair, C. E., Kopp, B., Distasio, J., Hwang, S. W., Lavoie, J., Veldhuizen, S., Voronka, J., Kaufman, A. F., Somers, J. M., LeBlanc, S. R., Cote, S., Addorisio, S., Matte, D. and Goering, P. (2016) ‘Housing Quality in a Randomized Controlled Trial of Housing First for Homeless Individuals with Mental Illness: Correlates and Associations with Outcomes’, Journal of Urban Health, 93(4), pp. 682-97. Aubry, T., Goering, P., Veldhuizen, S., Adair, C. E., Bourque, J., Distasio, J., Latimer, E., Stergiopoulos, V., Somers, J., Streiner, D. L. and Tsemberis, S. (2016) ‘A Multiple-City RCT of Housing First With Assertive Community Treatment for Homeless Canadians With Serious Mental Illness’, Psychiatric Services, 67(3), pp. 275-81. See references in chapters 5–10. See especially Oxford House model (section 7.4). For Housing First: Yamin, S., Aubry, T., Volk, J., Jette, J., Bourque, J. and Crouse, S. (2014) ‘Peer Supportive Housing for consumers of housing first who experience ongoing housing instability’, Canadian Journal of Community Mental Health, 33(4), pp. 61-76. McGuire, J., Rosenheck, R. A. and Kasprow, W. J. (2011) ‘Patient and program predictors of 12-month outcomes for homeless veterans following discharge from time-limited residential treatment’, Administration & Policy in Mental Health, 38(3), pp. 142-54. See also other references in chapter 8. Yanos, P. T., Felton, B. J., Tsemberis, S. and Frye, V. A. (2007) ‘Exploring the role of housing type, neighborhood characteristics, and lifestyle factors in the community integration of formerly homeless persons diagnosed with mental illness’, Journal of Mental Health, 16(6), pp. 703-717. 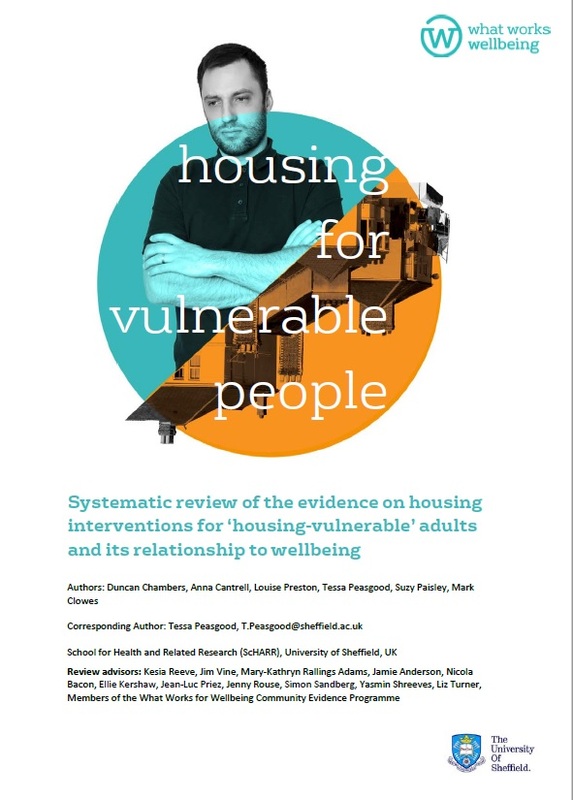 Stronger evidence for Housing First (chapter 5) and moderate evidence for some recovery housing interventions (chapter 7). 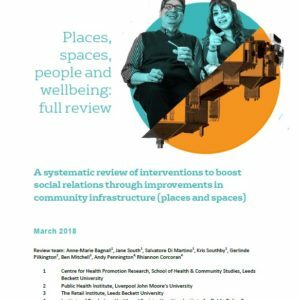 Moderate evidence for Housing First (chapter 5) and some recovery housing interventions (chapter 7). 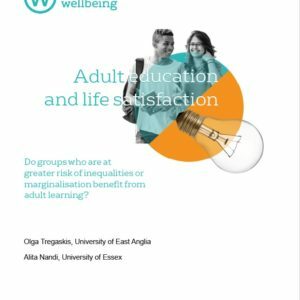 Moderate or low strength evidence for recovery housing (chapter 7) and supported housing (chapter 8), also UK evaluations of Housing First (section 5.5). Moderate evidence for Housing First (chapter 5) and recovery housing (chapter 7). Moderate or low strength of evidence for recovery housing (chapter 7). Housing First: Poremski, D., Stergiopoulos, V., Braithwaite, E., Distasio, J., Nisenbaum, R. and Latimer, E. (2016) ‘Effects of Housing First on Employment and Income of Homeless Individuals: Results of a Randomized Trial’, Psychiatric Services, 67(6), pp. 603-9. Moderate or low strength of evidence for recovery housing (chapter 7). Moderate evidence of no effect for Housing First (chapter 5).